The noax industrial PCs have high performance and a wide range of upgradeability. The proprietary noax PC motherboard is the main part in every noax computer. They are all assembled with Intel processors and most common interfaces such as serial I/Os, USBs and Ethernet. In addition, two PCI slot are available for additional special interfaces. This allows a simple connection of external peripheral devices. 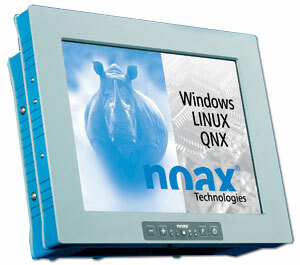 noax Panel Series industrial computers are especially designed for installation into panels or racks. The bezels of these PCs are NEMA 4X (IP65) watertight. The bezel material is V2A (304) stainless steel with special gaskets to seal the unit between panel and PC as well as between touch screen and bezel. This also allows easy cleaning or disinfection of the PC front panel. The panel series is available with 8.4/12.1/15 inch display sizes.